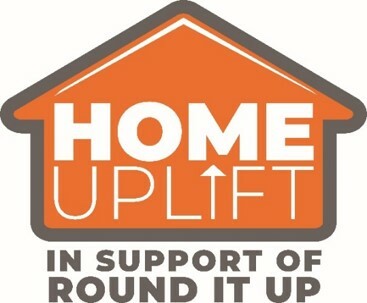 Round It Up allows you to put your spare change to work helping others in our community. If you choose to participate, KUB automatically rounds your bill up to the next dollar and sends 100 percent of that money to the Knoxville-Knox County Community Action Committee (CAC’s) weatherization assistance program. The program weatherizes homes for low-income families and individuals, helping to break the cycle of high utility bills due to inefficient homes and ongoing needs for bill payment assistance. Your change can help change our community for the better for pennies a month: the maximum contribution in a year would be $11.88 and the average is around $6. The program is voluntary, so you can opt in or decide to stop contributing at any time. Just log into your account and choose Billing Options. For the Round It Up section, select “Enrolled” or “Unenroll.” You can also call KUB at 524-2911 for assistance with your selection. For more information see Round It Up FAQs. The Knoxville Extreme Energy Makeover (KEEM), which ended in September 2017, was a $15 million TVA-funded program that provided energy upgrades for nearly 1,300 homes in Knoxville. The KEEM Team was led by the Knoxville-Knox County Community Action Committee (CAC) in partnership with the City of Knoxville, KUB, and the Alliance to Save Energy. Eligible homes received upgrades to reduce energy consumption and increase in-home comfort. Round It Up provides a sustainable, local funding source to help CAC continue assisting those in need. These weatherization programs provide a root-cause solution to an ongoing problem in our community—low income residents in energy-inefficient homes that are costly to heat and cool. 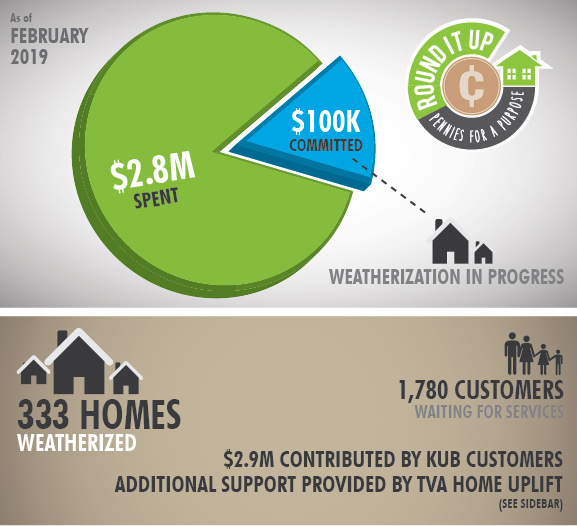 TVA has been an active partner with KUB and others in supporting low-income home weatherization in the KUB service area. To continue this positive community impact, TVA launched the Home Uplift Program in 2018. With $1 million in funding from TVA and $500,000 from the Federal Home Loan Bank of Cincinnati’s Affordable Housing Program, Home Uplift funds are leveraged with KUB customer contributions to Round It Up to allow twice as many homes to be served. As with Round It Up, CAC administers the weatherization services, and Home Federal Bank is also a partner.